Some of your friends like to decorate their lockers and everybody knows them for their sense of fashion and their imagination. You are known for the fancy sunny lunch box you carry every morning. 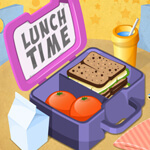 Let's make a trend and bring your lunch box at school loudly colored with yummy sandwiches and fresh fruits. 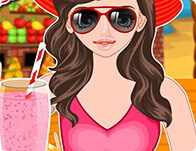 Show off your decoration skills and turn your launch box in anything else but not ordinary! Play with the colors and select the one you like best of all to color your stylish sunny lunch box and once you've decided that make sure you fill it with freshly made sandwiches with whole grained bread, or with yummy cheese or perhaps some yellow salty crackers and fresh fruits. Have fun decorating your sunny lunch box!